Oh my glaze! This cake is delicious. Between the bananas, yogurt and pineapple you are sure to have a moist cake. Hummingbird cakes can also be topped with a thicker frosting instead of a glaze – that’s up to you. Whatever you put on top, know that the cake is a winner! It’s amazing what kind of stories people associate with different foods. A colleague of mine said her grandmother used to bake just using boxed mixes – except when it came to hummingbird cake. She would make it from scratch with thick cream cheese frosting. I can just picture this southern woman from small town North Carolina making hummingbird cake for her whole family at one of those big family reunions. Can’t you? What cake recipe is in your family? Preheat the oven to 350. Thoroughly grease a bundt pan with butter. Coat the inside with flour, tapping out the excess. 1. In a small bowl, combine the flours, baking powder, baking soda, salt, and cinnamon. Whisk to blend; set aside. 2. In the bowl of an electric mixer, combine the butter and sugar. Beat on medium-high speed until light and fluffy, about 2-3 minutes. 3. Mix in the eggs one at a time, blending well after each addition. Blend in the vanilla and coconut extracts. Beat in the yogurt until well incorporated. With the mixer on low speed, beat in half of the dry ingredients, mixing just until incorporated. 4. Beat in the mashed bananas and then the remaining dry ingredients, again mixing just until incorporated. With a silicone spatula, gently fold in the coconut and chopped pineapple. 5. 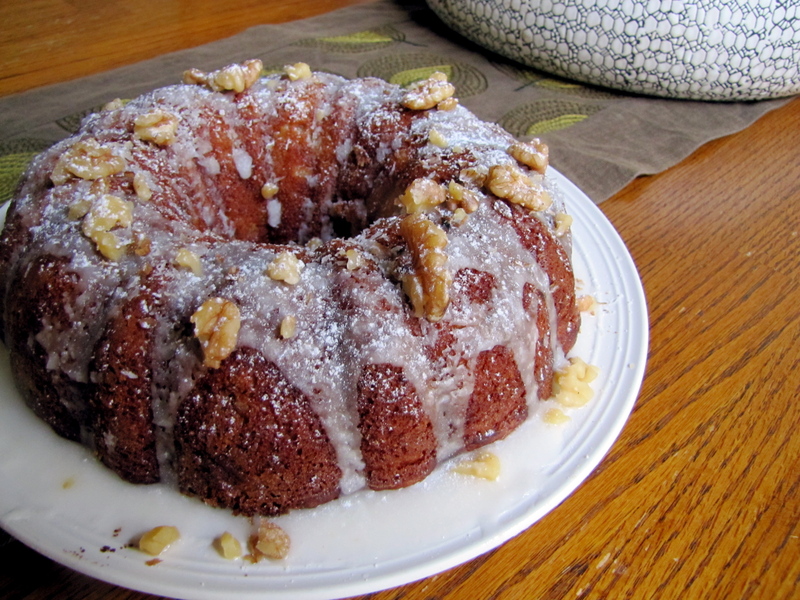 Transfer the batter to the prepared bundt pan and smooth into an even layer. Bake, rotating halfway through baking, until a toothpick inserted in the cake comes out clean, about 50-55 minutes. Let cool 20-30 minutes in the pan placed on a wire rack. Gently loosen the cake from the sides of the pan with a knife, and carefully turn out onto the cooling rack. Allow to cool completely. To make the glaze, whisk together all ingredients in a small bowl. If the glaze is too thin, whisk in more confectioners’ sugar. If the glaze is too thick, whisk in additional milk 1 teaspoon at a time. Drizzle the glaze over the top of the cooled cake. Sprinkle with shredded coconut and chopped nuts for garnish. Let glaze set before slicing and serving.